Indigo is a deep shade of blue derived from the Indian indigo plant. In ancient times, the plant was used to make dye for clothing and other accoutrements. In more modern times, the color has become associated with wisdom, intuition, perception, and the higher mind. (Well, if you believe the mystics, anyway.) If the latter is true, that’s a good thing because you’re going to need some higher mind skills to do well at this game. 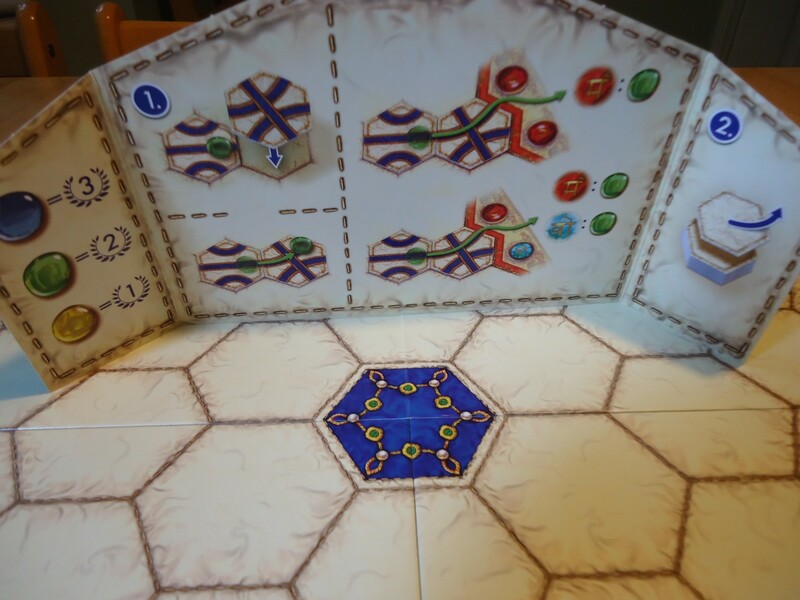 Indigo is a simple to learn abstract tile-laying game. Your goal is to gather the most gems/points by guiding them to an exit from the board which is under your control. The gems follow the pathways you create by laying tiles and connecting routes. Each player gets a screen and the six tokens in their player color. 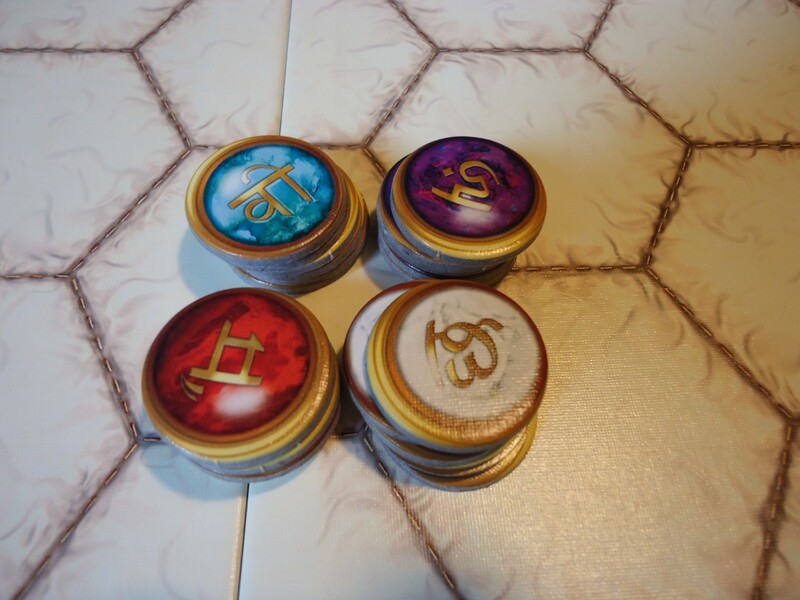 The tokens are placed on the exit gateways on the board in a manner that is determined by the number of players. (There’s a handy chart in the rulebook.) The tokens show who owns each gateway. In a two player game, no gateways are shared. In three or four player games, some or all of the gateways are controlled by multiple players. A 2-player game in progress. Each player takes a route tile and the game begins. On their turn, each player places a route tile on any unoccupied space. If there are no gems to be moved, play passes to the next player. If there are any gems along the route(s) of the just-placed tile, you must move them. If the just-placed route tile adjoins the center treasure tile, move one of the emeralds onto the new route until all of the emeralds have been used. When the sixth tile is played next to the treasure tile, only then may you move the sapphire. It must be the last gem to be moved off of the center tile. If the new route tile adjoins one of the treasure tiles that rings the board, then the amber gem is moved onto the new route. Gems are moved to the end of the newly created route. They cannot be moved further until a new route tile is placed in such a way that the route is extended. If the just-placed tile extends an existing route with a gem already on it, the player moves the gem to the end of this new route. 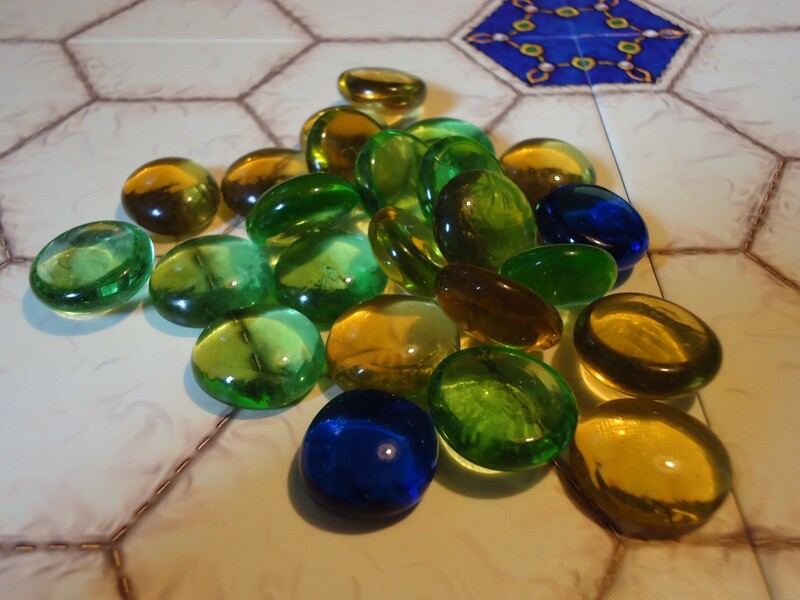 Gems can never move backward on a tile or return to a treasure tile. They can only move forward along the route created by the tile. The pretty gems you’re trying to win. If two gems meet up on the same route, both are removed from the game and no one scores any points from those gems. Once a gem reaches the edge of the board, it is awarded to the player who controls that gateway. If the gateway belongs to two players, a gem of the same color is taken from the reserves and awarded to the second player. Any collected gems are hidden behind your player screen. After the player has moved the required gems, he or she takes another route tile, hides it behind their screen, and play passes to the next player. The game ends when there are no more gems left on the board. For scoring purposes, a sapphire is worth three points, an emerald is worth two points, and an amber is worth one point. Players add up the value of their gems and the highest score wins. Since the game goes by so quickly, you can opt to play in rounds instead of just a single game. Determine in advance how many games you will play (each game being a round) and write down each player’s score at the end of each round. When you’ve reached the predetermined number of rounds, the player with the highest total wins. Are We Singing the Blues or Tickled Pink? In this genre of simple tile-laying games, Tsuro gets all the love, in part, I think, because it was featured on TableTop. Indigo is frequently overlooked. 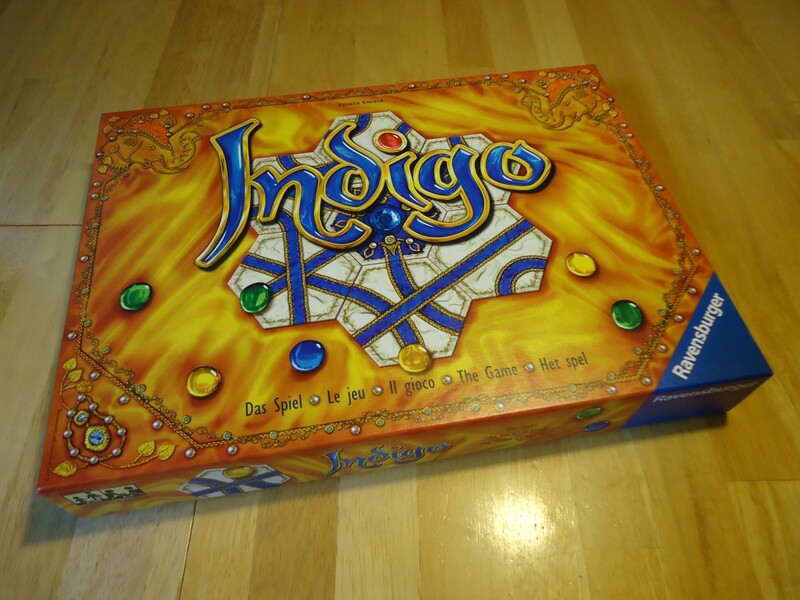 But I think that Indigo is the better game, especially for 2 – 4 players. Tsuro is almost a party game. They only thing you’re trying to do is drive your fellow players off the board. Indigo is similar, but also something else entirely. Yes, you’re laying tiles and moving things (gems) along the pathways, but it’s a much thinkier game than Tsuro, particularly as a two-player game. Even at the maximum of four players, there is still more involved than there is in Tsuro. Rather than simply trying to force everyone off the board, you’re playing for the highest score. And that changes everything. You want to move gems to the gateways you control. That seems easy enough. But if you’re playing with more than two players, you run into the problem of shared gateways. If you direct a gem off the board through one of those shared gateways, you will reward one of your opponents with a gem, as well. So what do you do? Do you try to get all the gems out on gateways that only you control (not possible in a four player game, as all gateways are shared) or do you try to form temporary alliances with other players so that you can both get something while hopefully denying your opponents what they want? You also have to be careful that you don’t guide a high value gem to a gateway shared by an opponent who needs it. Captured gems are kept behind the player screens, so there’s a memory element at play here. Did Joe get an emerald or an amber two turns ago? Would the emerald you’re chasing help him more than you? Remembering who has what adds to the challenge but if you’re good at it, it can help you form alliances with the right people and win the game. Other questions will plague your mind as you play. How aggressive do you want to be? Do you want to focus on one gem at a time and try to rush it off the board, or do you want to spread out your play so that you always have several gems as possible wins for yourself, at the risk that someone else gets there before you do? Do you want to try to actively deny other players gems by by putting gems onto their route so that both gems are removed from the game, or do you want to do your own thing? Do you want to focus on the easy amber gems or try for fewer gems, but more points? It sounds so easy: Move the gems along the pathways. But as you can see, it’s anything but. There are a couple of variants that can make the game a bit more challenging. First, you can play where each player keeps two route tiles in hand at all times, instead of one. This gives players more options and a bit more strategy. Which do you play now and which do you hold back? The back of the player screen doubles as a tip sheet. Second, the base rules of the game dictate that you hold your tile(s) behind your screen so that no one else can see what you have. But if you’re playing with the two tiles per player variant, you can place one behind the screen and leave the second one on the table so that it’s visible to everyone. This adds yet another layer of strategy because other players know what at least one of your options might be. Do they play based on the tile they can see, on the tile they suspect you’re hiding, or do they just disregard you entirely and play the tile that best suits them? Playing this way ups the brain burn another level. It’s also possible to play the four player game in teams of two. This version is a bit more interactive as team members discuss their strategy and work to guide the gems to the most beneficial gateways. In this version, there will be gateways that are controlled by both team members, so it’s a bit more like the two or three player game in the sense that some gateways give you total control while others will have to be carefully considered to avoid giving too much to your opponents. For all of this thinking going on, the rules are incredibly simple. Set up is a breeze, too. This makes Indigo the sort of game thats great for families and non-gamers, as well as gamers. Kids can play and be competitive at Indigo without the parents feeling like they have to throw the game so the kids can win. With a starting age of eight, this is an ideal family game. Since there’s no reading involved and scoring is simple addition, younger kids might be able to play with a little help from mom and dad, or by playing the team variant with an adult on their team. The insert holds everything neatly. The game plays well at all player counts. With just two, it’s much more of a brain burner. Three adds the shared gateways and the alliance aspect so it’s still very thinky, but a bit of randomness and nastiness creeps in. With four, it feels more random and that luck plays a greater role. The board changes a lot between turns in a four player game so there’s less ability to plan ahead. Since all the gateways are shared, you have to do a lot of choosing between the lesser of two evils when deciding where to exit your gems. All player counts are fun, though, and highly recommended. No matter how challenging you make it, Indigo still plays very quickly. That’s why the designers offer the option of playing a match consisting of several games and the highest total score wins. Playing that way allows you to get a bit more out of the game. Of course, if you’re playing as a filler or with kids with a short attention span, playing just one game is still fun. The set up is so easy that you don’t feel like you’re getting ripped off if all you do is play once and put it back in the box. Speaking of ripped off, I think Indigo is one of the best values in gaming. Like Labyrinth, another simple yet challenging family game from Ravensburger, Indigo can often be found for under $20 on sale. 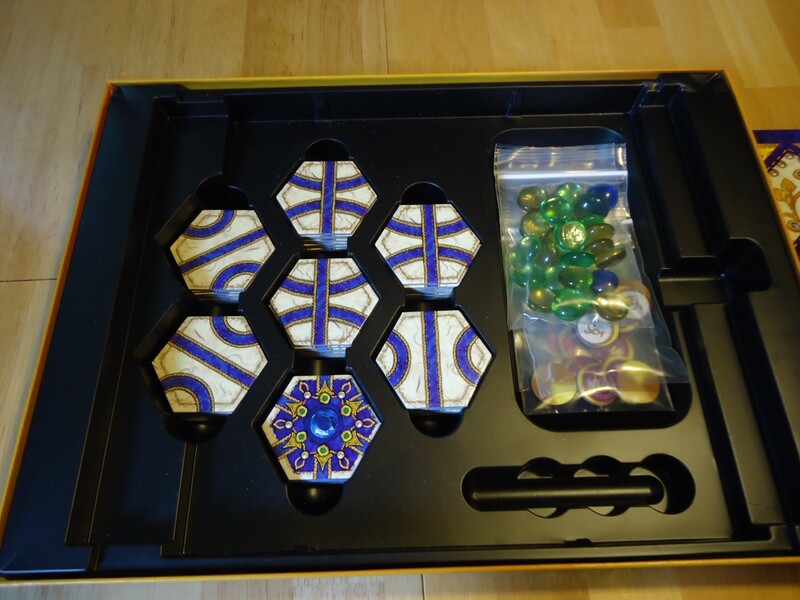 With its sturdy components, glass gems, lovely artwork, and simple yet thinky game play, it’s a great deal. Indigo was a Tsuro killer for me. Once we got it, I gave away my copy of Tsuro. Since we very rarely play with more than four players, I knew Tsuro would likely never hit the table again. It may be worth keeping Tsuro if you regularly play with larger groups, but for us Indigo does everything that Tsuro does plus more, and it does it all much better. Simple to learn ruleset and quick play time make it good for weeknights and new gamers. A family game that both kids and adults can play without either group being bored. 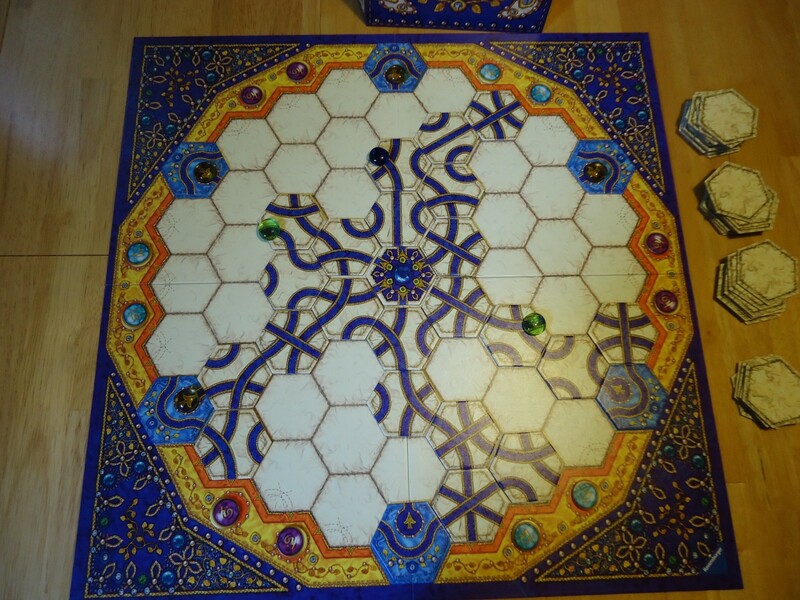 Lovely art, gems, and tiles make for a very attractive abstract. Can often be found below $20; great value. Deeper than Tsuro with more options and strategy, and no player elimination. Despite the pretty package, there is no theme here. It's a true abstract. There can be some nastiness if other players decide to go after each other. This is a Knizia game I haven’t played yet. I’ll have to give it a look. Thanks for the review!